So, I came up with this idea to do a series of posts ranking the best jerseys in the ECHL. I got in contact with Chris Smith at icethetics.co and he allowed me to use his ECHL jersey gallery for my posts, so a HUGE thank you to Chris for all of the jersey graphics. I came up with the rating that encompassed originality, creativity, color scheme and more. So without further ado, here are my reviews of the ECHL North Division. 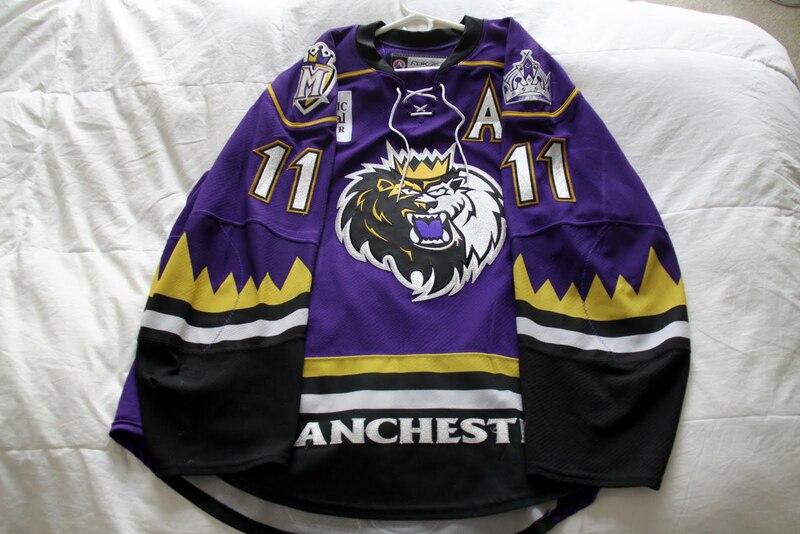 The Monarchs wear a simple but somewhat boring Los Angeles Kings theme jersey. The simple and sleek LA Kings logo rests on the shoulder as well as on the pants of each player. It is difficult to make the black, white and gray/silver colors of the LA Kings exciting. Personally, I am a fan of the old purple, gold and black version of the Monarchs. Black is great on any jersey, especially when it is worn as one of the two primary jerseys. So because of that, Manchester gains points from me, but the lack of originality is what turns me away from these jerseys. Originally, I was not a huge fan of the Beast uniforms. Though I will admit, because I have seen them a few times in person, they have grown on me. I still don’t really understand what the Beast logo is, wolf? werewolf? bigfoot? Regardless, it is some sort of very angry, gray wolf thing. Anyway, stepping away from the logo and back to the jerseys. The color scheme is good, I like the black, red and gray. Although, it does remind me of a 90’s color scheme. Like Manchester, Brampton has their NHL affiliate logos on each shoulder. In my opinion, it looks great when teams have their affiliate logo on their jersey, though I would like to see their AHL affiliate, the St. John’s IceCaps, as well. Again, back to a black jersey, it looks great. There isn’t too much red so it doesn’t ruin the rest of the jersey. The sleeves and large stripe on the arm remind me of the Winnipeg Jets road jersey. Brampton isn’t the best jersey in the North Division but certainly isn’t the worst. As I have been saying, black jersey automatically gets points from me. Reading sneaks through the ECHL with some of the best uniforms, by far. The black and purple color scheme is what jumps out first. The purple blends in with the black jersey but with the white middle stripe, it jumps out just enough to look great. The circular logo with the Royals logo in the middle is very similar to the Chicago Blackhawks Winter Classic jersey in 2012. Regardless of that similarity, the circular logo reminds me of a European soccer club and as long as it isn’t overused, it looks good. The Royals’ lion logo on each shoulder makes it somewhat busy but not enough to ruin the jersey. The one thing I like about Reading is their home and road jerseys are completely different designs. I like the simple design of the white jersey, just one purple stripe gives the jersey a clean look. The Royals “R” with the crown on the front is one of my favorite parts of the jerseys. It is a sleek logo that works great with the purple stripes. I am not a huge fan of Adirondack’s jerseys. The Calgary Flames theme is what ruins the jerseys for me. I don’t mind when teams use the same colors as their NHL or AHL affiliate but when the jersey is the same or nearly the same, it ruins it. I like the use of the flags on the shoulders, similar to their affiliate in Calgary but with their own unique flags. I like jerseys with the piping around the shoulders but to me, the whole uniform is way too similar to the Flames. Ah, the Wheeling Nailers. One of the best team names in all of hockey. Their logo pays homage to their city’s heritage of owning one of the largest cut nail plants in the world. Chris Creamer at sportslogos.net wrote a great article about the story behind the Wheeling Nailers name. The Pittsburgh Penguins Vegas gold works really well with the Nailers name and jerseys. Before this season, Wheeling wore the same jerseys as their affiliate in Pittsburgh. I am glad they switched because I like that they have their own identity. Enough about the logo, Wheeling’s jersey combo is interesting. Their white jersey is simple and classic while their black one is, well, different. I am a big fan of Wheeling’s white jersey. The two stripes and black shoulder yoke give it a really sleek and simple look. Both jerseys have the Penguins logo on the shoulder, which I think is a great look for AHL and ECHL teams. The Nailers black jersey is not quite as nice as their white. I always like a black jersey but the vegas gold under the arms and all the way around the back ruins the jersey. If the Nailers went with a black version of the white jersey, they would have some of the best jerseys in the league. Elmira has always had a nice jersey combo. I like the red, white and blue color scheme as well as the sometimes used gray. Having both the Buffalo Sabres and Rochester Americans logo on the shoulders is a great look for the team and reminds fans how close they are to their team. Although the red, white and blue color scheme is a good one, I am not a big fan of the half red, half blue arm. It isn’t a horrible look but it isn’t the best look in my opinion. One thing I really enjoy about Elmira’s uniforms is the blue sides on the white, it’s a good look. The blue jersey is nice but the white armpits are terrible. When it is on the ice and in action, it just isn’t a good look.